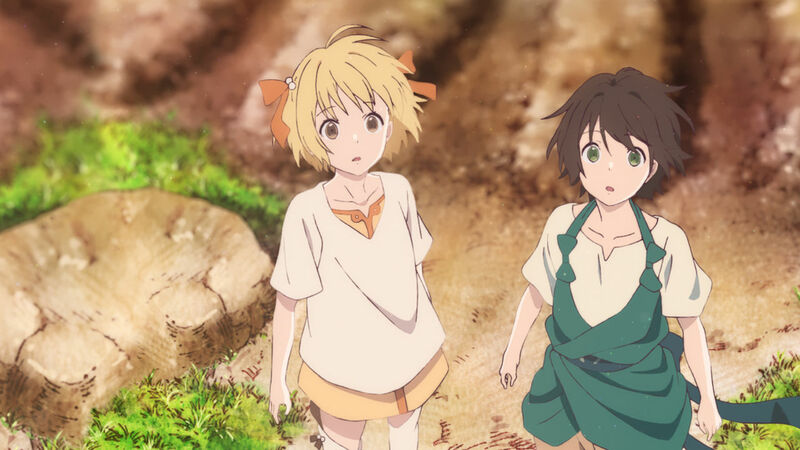 The foundation is laid for an interesting adventure in Children of the Whales, especially as it pushes from the idea we are seeing the last of mankind to something else. In what almost appears to be a different kind of post-apocalyptic world, from what it seems, all that remains of humanity, 513 people, may live on one drifting island. A place in which there are two kinds of humans. One being those who can use Thymia, which is magic, and those who can’t, known as the unmarked. Now, those who are marked, who can use Thymia, are unfortunately unable to usually live past their 30s. Thus making the unmarked the mayor and elders of the island. The split, so we are told by our lead Chakuro, is 90/10 with marked being the majority. Now, as for why magic users would allow non-magic users to lead? That is hard to say. However, what is known though is that those who break the rules are sent into what is called “The Internal” a dark place on the island where people can’t use their magic. People like Ouni who are considered one of the strongest users around. Possibly because, unlike most, he doesn’t hold back his emotions. Which is a problem to many since emotions are what fuel Thymia and people are taught is the reason for a quicker death. So, needless to say, suppressing emotions is common. However, upon the discovery of a girl who is referred to as Lykos, so breaks this idea they are the last of the humans. But, things get more interesting as the elders reveal they have long known they weren’t the last of the humans. Which, upon Ouni learning of this he snatches both Lykos and Chakuro to venture back to where Lykos is found. Sending off all kinds of alarms in the process. What happened to humanity that led to the need for isolation? Did humanity just manifest powers or did they always have them in this show’s world? Considering many become weak and die sometime around 30, what is the average age to have kids or do only the unmarked do that? So is the world now just a bunch of islands in a sea of sand? Also, with all that sand, where in the world did the rain come from? With the elders hiding, for who knows how many generations, that there is a complete outside world, there comes a question of what that world looks like? With the way Lykos appeared to us, it seems safe to assume it is a world torn by violence of the highest order. However, is it a world which still looks like the classical age or could it be like many post-apocalyptic worlds in which we see destroyed buildings and things of that nature? The premiere drives this curiosity into a strong hook for what’s to come. While by no means blown away by yet another teenage coming of age story, Chakuro is likable enough. The same goes for Lykos and Ouni. They may not be the most interesting of mysterious, kind of brooding, characters, but they’ll do. Which could become a problem in time, but for the first episode, they’re good enough to want to continue the story. It was kind of weird how the style of the background and style of the character weirdly clashed in a way. Take, for example, the image above. The background looks like a scan in which someone accidently used resume paper and then mixed in our characters. Thus giving us a look which I would love to say is acceptable, but honestly, and this is coming from someone who isn’t big into how pretty things are, it looks kind of ugly. The adventure aspect is perhaps the best part of the show, but the problem which coincides with that is the people we’re on an adventure with aren’t the most interesting. On top of that, it isn’t like the art style for the world we’ll be traversing is that interesting. So, as of the first episode, seeing what the elders were hiding, or shielding, everyone from is the hook. But, with that in mind, so leads to why this is being labeled mixed. If the outside world isn’t that interesting, and those left in it, this show will probably tank quickly. For while it is cool people use magic and we’re in some strange times during the course of humanity, the people we’ve met thus far need compelling characters and ideas to challenge them. Especially since our lead is your generic tween who knows nothing about nothing and is overly naive. Which gets paired with a brooding teen who seems to be a rebel without a cause and this blank slate who worked as a catalyst to learn about the outside world, but doesn’t necessarily come off as someone you’d want to venture with. Hopefully, though, they’ll grow on us.